Teaching needlework to children is fun! Teaching needlework to children is a fantastic way to share your passion for needlework. Today a lady phoned me and explained "I love stitching. I am in my seventies and only started doing needlework 4 years ago. I have a lot of catching up to do! I wish I had learned as a child, then I would have had a lifetime's enjoyment from it." 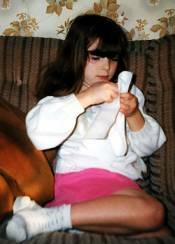 I was lucky enough to learn needlework at my grandmother's knee. 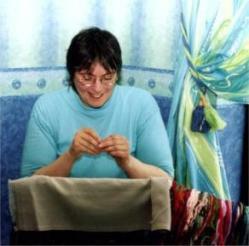 I watched her embroidering and was even allowed to put my own clumsy stitches into her beautiful tablecloths. Even if they were untidy, my stitches stayed in her work, she wouldn't let me take them out to re-do them. "Try again" she would say, pointing to a different place to stitch. Teaching needlework to children is important to me. I taught my daughter, Becky, when she was seven. We started with a piece of binca and some embroidery threads. I showed her some simple embroidery stitches and let her have fun. You can see her first ever piece of needlework in the photograph below. 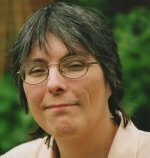 Just after my daughter started infant school, at around age seven, I was asked if I would give up an hour or two a week and spend it teaching needlework to children in her class. I jumped at the opportunity. With Mother's Day on the horizon I started by getting the children, a group of 8 including 3 boys, to chart their ideas for a card onto big squared paper. I helped them colour in the squares forming simple flowers, the letters MUM and even a tractor! All the children had fun the first week and asked me if I would be back the next day so they could start sewing! I guess a week seems like a long time at seven years old. In our next lesson I piled binca fabric and lots of different coloured threads in the middle of the table and they all made their choice. We started with cross stitch and at this stage I didn't worry about whether all their crosses went the same way just that they made a start. I remember spending most of the lesson rethreading needles so the following week I took along needle threaders and showed the children how to use them. Seven of the children were happily stitching away by the end of the lesson but not Nicholas. He sat in his chair still happily doodling away on his paper. "Perhaps next time" was all he would say when asked if he wanted to get started. By the end of the third session, young Nicholas still hadn't begun his mothers day card. I took him to one side and asked him if there was a problem. He burst into tears and told me that his mother had insisted that stitching was for girls and no son of hers was going to do it! The teacher phoned her and discovered that teaching needlework to children, in her opinion, should consist of showing them how to sew on a button and that was all any boy needed to learn! She couldn't see why teaching children cross stitch was on the curriculum. The teacher and I did not argue, but invited Nicholas to sit in if he wanted to whenever I came to the classroom. After a couple more lessons, he picked up a piece of fabric and asked me to thread a needle with the "string". He then started his tractor and I discovered that he had been listening and taking in the information I had been passing on to the other children. By the time my series of classes came to an end eight mother's day cards were complete. I was unsure of the reaction we would receive from Nicholas' mother, but he had really enjoyed working on his project so we sent it home with him, our fingers crossed. On the Monday Nicholas' mum rang up in tears. She apologised for trying to intervene in the needlework lessons and thanked us for letting him join in. She was delighted when he proudly presented his hand-made card to her on Mother's Day. This experience of teaching needlework to children gave me as much fun as it did them, and nearly 20 years later I know that some of them still pick up a needle from time to time. Teaching needlework to children is a rewarding way of sharing your knowledge and could start them off on hobby that lasts a lifetime. 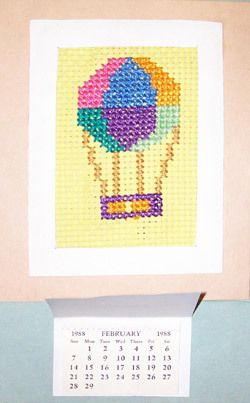 Check out my page on learning how to cross stitch for more information. Tent stitch on plastic canvas is also a simple technique to get them started. 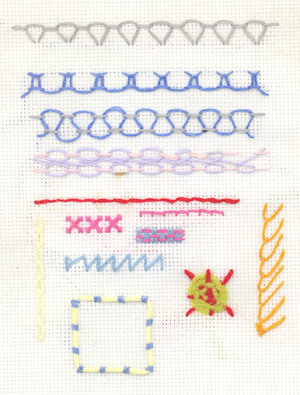 Another page you might find useful is the basic embroidery stitch index.